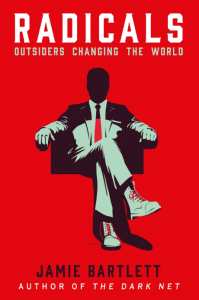 In Radicals: Outsiders Changing the World, Jamie Bartlett probes into the worldviews and lives of individuals, groups and movements who are seeking to change the way we live now and examines their ostensibly radical properties. Bartlett’s natural storytelling abilities, shaped by his sensitive yet probing approach, make for an engaging read. This book inspires both enthusiasm and caution about radical thinking today, writes David Beer, and raises questions regarding how radical ideas take hold and circulate. Radicals: Outsiders Changing the World. Jamie Bartlett. Penguin. 2017. Among the characters described in Jamie Bartlett’s Radicals, I’m finding it hard to shake the image of the grinders. A particularly dedicated and self-focused branch of biohackers, grinders operate on their own bodies, adding microchips, devices and prosthetics as they seek to turn themselves into living DIY cyborgs. This is a kind of meat and metal transhumanism — one that the grinders see as standing apart from the abstractions and pointless waffle of the transhumanist movement. The transhumanists want to think about how technology can extend and enhance human life; the biohackers want to get stuck into the practicalities of testing and experimenting. This is where Bartlett’s book is so successful. He is a natural storyteller and Radicals is a book of tales. Showing understanding and humility, moving himself into the role of outsider or studied observer when needed, Bartlett exercises the art of storytelling. The chapters follow a series of individuals and groups to explore their apparently radical properties. Each looks closely at the toils, successes and failures of those figures and the features of their thinking that might lead them to be labelled radical. Often mixing individual human stories with those of the movements of which they are a part, the book ranges across a transhumanist presidential hopeful, eco-protestors, mushroom-eating gatherings, a commune pursuing self-sufficiency, a libertarian nation-state start-up and a comedian-led anti-establishment political party, through to an interlude on the ‘Prevent’ strategy and an account of some disturbing multinational Islamophobia. Bartlett’s ability to be probing whilst remaining sensitive and non-dismissive draws out intriguing details that could easily have been lost — the state of the mattress in a commune love-shack, the emotional post-match reactions to hallucinogens, the character traits in a Five Star meeting, the revelation that a coffin-shaped bus was used partly to try to highlight a problem with American democracy and so on. For want of a more accurate comparison, this is documentary storytelling in the mode of Louis Theroux. As a result, subtleties emerge, such as tension between what appears, on the surface, to be philosophically aligned: for instance, biohackers and transhumanists. Intriguing and sometimes fraught with a little jeopardy, you can’t help but get hooked on the narratives. In places, the stories seem unreal or like Bartlett is gate-crashing a film set. In other cases, the stories are grim and all too gritty, upsetting in how easy it is for unpalatable ideas to circulate and create action. There is a message here about what happens when frustration builds. Bartlett’s argument is that we need different radical approaches, however unsettling, to enable genuine debate to thrive. Radicals are important, Bartlett suggests, because they bring both disobedience and the possibility of getting things wrong. Genuine radicals, by definition, are hard to find. An easy point to make about a book like this would be to take issue with the selection of stories chosen. In places I found myself wondering if these were, indeed, all that radical. Psychedelics and free-love communes seem a bit dog-eared. People have been implanting themselves with RFID chips for well over a decade. And setting up a new nation state has even been the focus of a fairly well-known comedy series. In places Bartlett acknowledges this, and adds reflections on the ‘unoriginality’ of what he is seeing. I’m not sure that matters though. In all cases, the contemporary context lends new life or new circumstances to even old ideas. And anyway, this seems to be a book about people trying to be radicals. I started to wonder if these characters were actually trapped in the idea of what a radical is, causing patterns to be repeated. Bartlett’s stories are laced with more than enough self-awareness for him to see the limits of the various propositions on display. As I read the accounts, I sometimes imagined the author flashing a knowing glance to camera — occasionally that glance was tinged with discomfort and even, in some key moments, deep concern. Bartlett’s radicals may not always be all that radical, and they certainly bring out a strong sense of disgust in some cases, but their stories tell of something beyond the surface. These stories often feel symptomatic. As well as being a book about radicals, it is a book about problems. Sometimes the radicals are trying to solve the problem; in other cases they embody one. As Bartlett begins the book, he claims that: ‘although we have more information, fast computers and clever analysts to understand these problems, we seem less and less capable to predict or affect any of them’. We can’t data-analyse our way out of a number of these issues, especially as we are data-analysing our way into quite a few of them. Undoubtedly we find ourselves in a moment that calls for some radical thinking — which is probably something you could have said for most moments in history. Bartlett acknowledges that there were some political shifts whilst he was working on his book, shifts that altered what might be seen to be radical. Genuinely radical thinking can’t now deal only in grand issues: it needs to ask how we can stem the rise in homelessness, transcend growing prejudice and divisions, make social housing safe, reopen libraries or rebuild crumbling health and education systems. Bartlett’s prediction is that there is more to come. His book was finished in 2016 and the events of 2017 seem to lend it some credibility. He identifies the shifts in 2016 as being early signs of a ‘more significant realignment’ and that political norms will change. Prediction is difficult at the moment, but this one seems to have some weight. If this realignment does continue to unfold, then some radical notions might well be guiding it. Bartlett’s book inspires both caution and enthusiasm for radical thinking. The current moment is defined by a battle for ideas in a mutating public sphere of social media, algorithms and unfettered real-time reaction. In this context, I’d be a bit worried that we don’t really fully understand how ideas circulate or who is able to conjure the authority to make those ideas visible and give them power. As Bartlett points out, it is what is seen to be possible that is at stake. As this book begins to illustrate, it is not just ideas themselves that matter, but how they become part of the world; how they are promoted, controlled and silenced. This is no fault of Bartlett’s, but I’m left wondering about the mechanisms by which radical ideas take hold. This post represents the views of the author and not those of Democratic Audit. It was originally published here and is reposted with the permission of David Beer. David Beer is Reader in Sociology at the University of York. Popular Culture and New Media: The Politics of Circulation is now available in paperback. His most recent book is Metric Power. You can find him on Twitter @davidgbeer.